Mexican Salad Dressing! Easiest ever in the history of Mexico. As a follow up to my Mexican Food Fan post, here is a salad dressing for you! This has to be tthe easiest Mexican salad dressing ever in the history of Mexico! :) Here are the TWO things you need to make this “couldn’t be easier” home made dressing! Yes, seriously. That’s it. 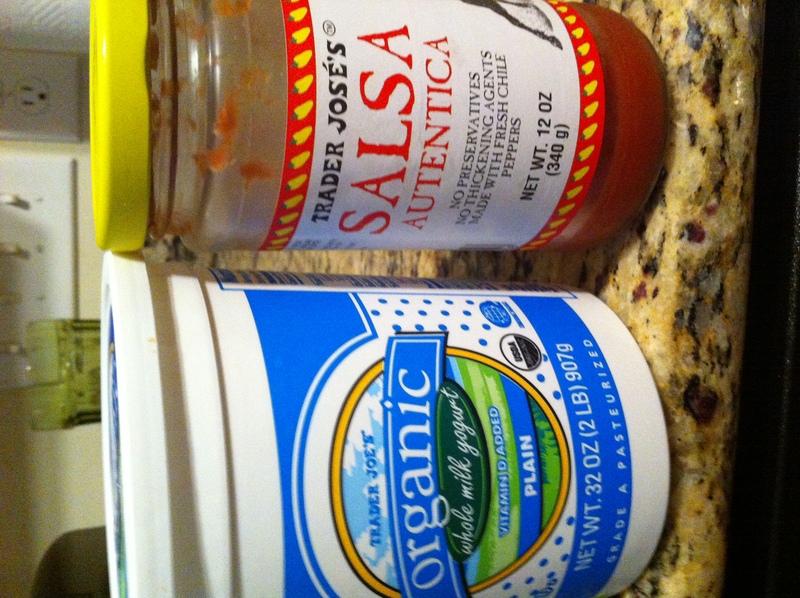 Of course, home-made plain yogurt (Google it, cause I’m not there yet) and home-made salsa are best, but if you don’t have time for that, use an organic (or natural, no chemicals/hormones added) store-bought version of each of these. I do half and half to make my dressing, but use the ratio you prefer. You could use sour cream if you don’t have plain yogurt. Since we’re all trying to eat more vegetables (aka “salads”), this is one more way to give you some variety in the salads area (and encourage you to keep eating greens!). We like our Mexican Salad (sans shell) with seasoned grass-fed beef, raw milk white cheddar, plenty of veg including fresh cilantro, and this dressing. If you must have the shell, use organic corn chips or break an organic taco shell instead. The chips are smaller, and likely fewer ingredients than the giant taco salad shells I’ve seen. Let me know if you try this with other ingredients too. Ole! This entry was posted in Condiments & sauces & dressings, Getting Started, Meats & Main Dishes, Recipes, Salads and tagged food, grass fed beef, mexican salad, organic corn chips, salad, salad dressing, taco shell by OrganicEater. Bookmark the permalink. GREAT idea. We just did something similar to this for lunch on our taco salads. Hadn’t thought of actually mixing the two together. We just drop on the top. Humm, now I’m gonna have to try this for regular dressing. Thanks for the great tip and LOVE that it’s so easy! IF ANYONE TRIES THIS WITH ALMOND MILK YOGURT OR COCONUT MILK YOGURT PLEASE LET ME KNOW! I am anxious to try one of those and see how it works.